The MISD Council of Parent Teacher Associations (PTA) was formed in May of 1990 to help provide guidance and support to the Local PTA units in the Mansfield Independent School District. When the organization launched, Mansfield ISD had 11 schools and ten PTAs. As the school district began to quickly grow, so was the need for support. We currently have 41 schools and 43 PTAs which includes the Mansfield Early Childhood PTA and Mansfield Special Education PTA. Mansfield ISD is one of the few school districts of its size with a PTA represented on 100% of school campuses. This was not an easy task, but with the support and guidance the MISD Council of PTAs provides, we can say this with PRIDE!!! We are also proud to say we have the support of our MISD Superintendent, Administration Staff, and the Principals at all our local campuses. NOTE: The MISD Council of PTAs is a 501(c)3 nonpartisan association. As such, we do not endorse any political candidates, but we do appreciate all candidates who are willing to serve the students of our community. 2018-19 MISD Council Meetings - MISD Council has six meetings each school year in which all PTAs are represented by their president and delegates. Sept. 10 | 7 p.m.
Nov. 5 | 7 p.m.
Feb. 4 | 7 p.m.
March 4 | 7 p.m.
April 1 | 7 p.m. 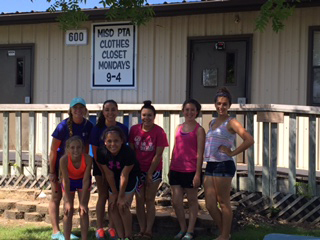 The MISD Clothes Closet needs your help. Visit our section below. Visit our Council PTA Documents and Forms section for updated information. Note: Campus PTA Calendars can be found on the individual school website. Back the Future from Texas PTA on Vimeo. The MISD Clothes Closet, founded in 2000, provides clothing and school supplies free of charge to Mansfield ISD students. Over 1300 families were served last year due to your help. Without your assistance, the Council would not be able to serve as many families as we do each year since the program has been in existence. In addition, the Clothes Closet partners with The World Wear Project. Their mission is to keep textiles and other recyclable items out of landfills as well as provide local and international communities with jobs and affordable clothing. Items that cannot be used by the MISD Clothes Closet are donated to WWP which pays a per pound price back to The Closet. This money is used to purchase socks and underwear. To gain access, parents must obtain a voucher for each child from their school nurse or counselor. A school supply voucher provides a student with a one-time visit for supplies and backpacks. Campus Clothing Drives - We greatly appreciate campuses conducting their own clothing drives. Please view our monthly wish list for our most needed items. You can also review our How You Can Help? handout for different ideas on how you or your organization can help the Clothes Closet. PTA Clothes Closet Contest - Help the Clothes Closet keep our stock full by participating in our annual MISD Clothes Closet Contest. View 2018-19 contest rules and prizes. The Closet is partially staffed by local PTAs, but independent volunteers are always welcome and appreciated. Do you or someone you know need volunteer hours? We have several evening shifts available for organizing and switching out seasonal clothing. Please contact Desiree Thomas at 817-692-5181 for complete information. A complete selection of PTA resource guides, documents and forms are available on the Texas PTA website.